Yesterday against my better judgment I went to a mall to pick up a few gifts for Christmas. I didn’t always dislike shopping, in fact there was probably a time when I would say I loved shopping, but those days are long gone. Lately I get stressed just thinking about it. But I put my stress aside, braved the incredibly full parking lot, all for the love of a young child. Now here’s the thing, my kids are now adults and the toys today don’t make sense to me anymore. What is a L.O.L Surprise? Or Hatchimals? What happens after the thing hatches? I even saw a board game called Pop-a-Zit! No kidding! Someone is going to wake up on Christmas morning and open that up! Yikes. As I perused the overwhelming selection of toys my eyes fell upon a plain wooden Nativity set. It was so simple. It seemed so insignificant in amongst all the electronic widgets and whatchamacallits, not to mention the bells and whistles. And yet there was a charm in its simplicity. I picked it up and I wondered if the young person I was thinking about would find this as charming as I did. Probably not, so I put it down. As I walked aisle upon aisle of toys, I remembered what our family used to do when our kids were younger. 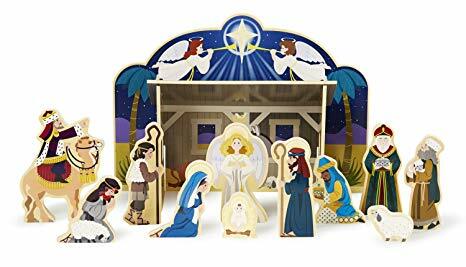 I would set up the nativity scene with Mary and Joseph, the animals and the shepherds gathered in or around the stable. But the wise men were placed at the opposite end of the house. Each day during advent, the wise men were moved just a little closer to the manger scene. We had traveling wise men. Some years we had the entire set spread all over the house and throughout the month of Advent moved closer to the stable. It was so fun! The memory of that led me right back to the simple, wooden nativity set. I picked it up and put it in my cart with a hope that our wacky tradition might continue in another family’s home. Christmas is first and foremost a celebration of God’s love toward all humanity. The little baby in the manger is more than just a sweet little child. He is the image of God. He is God made flesh so that in that body he might take on the sins of the world. Jesus is God’s free and simple gift to each of us. This is what Christmas is about. This is why I have traveling wise men: they are a reminder to me and my family of what we have been given in Christ – GRACE. The most amazing thing about this is that God did it for you and for me – for no other reason than His unconditional love for us. He entered into this world, took on human flesh, and died on a cross to bear our sin. God did all this so that we might enter into His presence and experience the peace, hope, joy and love that He brought into the world. Each Sunday at Amberlea we are building onto our Nativity scene on a felt storyboard. It’s so much fun to watch the children engage as we build on the story each week. Not unlike our journeying wise men! Come join us as we journey through Advent together! Question: What did I buy? Let’s celebrate the season of Advent together as we continue with Part 2 of our sermon series entitled: God With Us.